Explore mindfulness on a deeper level through guided meditations and discussion in a calming, soothing location. Relax the body, calm the mind, soothe the soul, and open the heart with the sensual aroma of lavender unified with somatic meditative techniques that ground you into your body. 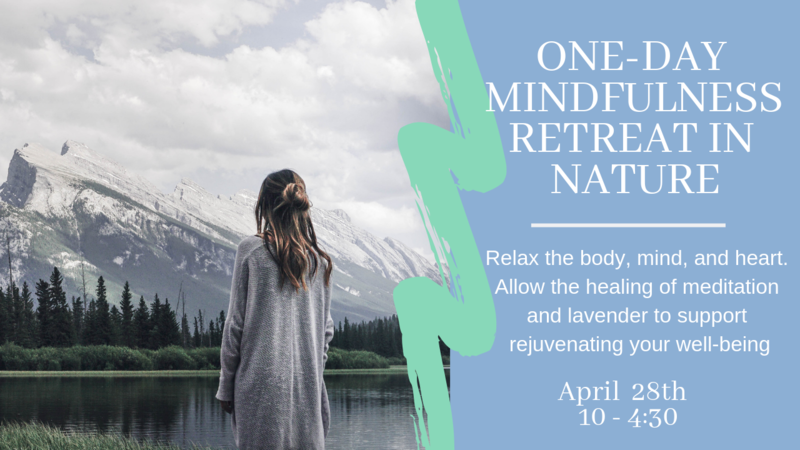 The beauty of the natural environment of this location will cradle your essence as you are guided through the sensual experience of somatic meditation. Release burdens from your shoulders as your heart finds space to open and heal: Unveil the harmony and peace already abiding within and learn integrative skills that you can carry with you back into your everyday life. Through the support of teachers, community, journaling, and meditation you will heal, harmonize, and revitalize your essence. 12:30-2:00 Lunch: Opportunity for self-reflection, solitary connection with the land. Connect with fellow participants and teachers individually. nature to heal body, mind, and soul. 3:30 Discussion, sharing, and community connectivity. 4:30 Closing practice and introduction to an ongoing support network. Bring a journal and come prepared for both walking and seated meditation!